Home Styles Biscayne 5-Piece Set includes 48-inch Round Outdoor Dining Table and Four Swivel Chairs with Sunbrella<sup></sup> Green Apple fabric Cushions. Set is constructed of cast aluminum with a white finish. Features include powder coat finish sealed with a clear coat to protect finish, attractively patterned table top has center opening to accommodate umbrellas, and nylon glides on all legs. The Home Styles Biscayne 5-Piece Set includes a 42-inch Round Outdoor Dining Table and 4 Arm Chairs. 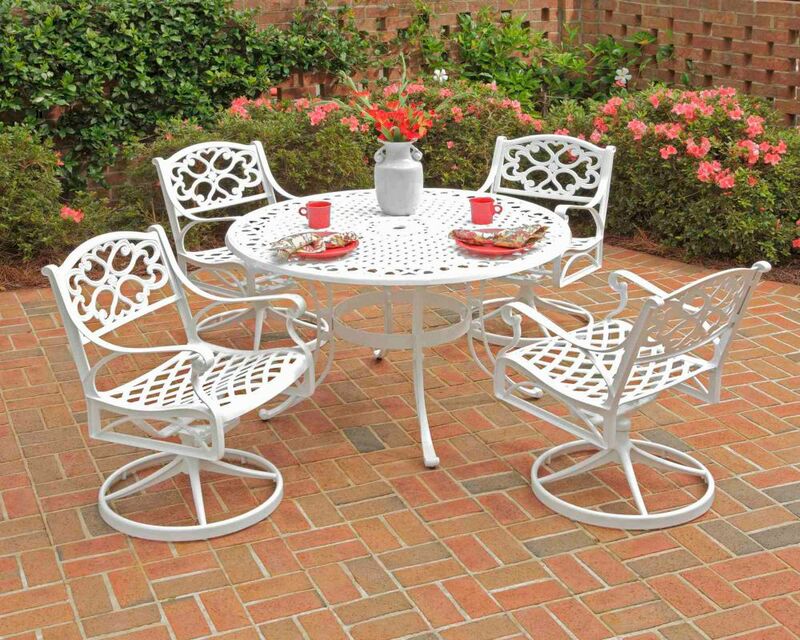 This set is constructed of cast aluminum with a White finish. Features include a powder-coated finish sealed with a clear coat to protect the finish, an attractively patterned table top with a center opening to accommodate umbrellas, and nylon glides on all legs. By combining outdoor elements such as ceremonial and abstract floral designs, the Floral Blossom Dining Set by Home Style is brought to life. This set is constructed of cast aluminum in a powder coated white finish sealed with a clear top coat for protection. The 48-inch outdoor table and four chairs features weather resistant gray polyester cushions, attractive patterned design, 2-inch umbrella hole with white cap, nylon glides on legs for stability, tilt mechanism umbrella, and matching floral designed umbrella stand. Elegant design and sturdy construction, this piece is finished with stainless steel hardware. Assembly required. Set includes 48-inch table, two swivel chairs w/ cushions, two arm chairs w/ cushions, umbrella, and umbrella stand. Table Size: 48w 48d 29h. Chair Size: 25.1w 26.7d 36.5h. Umbrella Stand Size: 18w 18d 14.5h. Umbrella Size: 108w 108d 96.5h. Biscayne 5-Piece White Patio Dining Set with 48-inch Dining Table & Four Swivel Chairs with Cushions Home Styles Biscayne 5-Piece Set includes 48-inch Round Outdoor Dining Table and Four Swivel Chairs with Sunbrella<sup></sup> Green Apple fabric Cushions. Set is constructed of cast aluminum with a white finish. Features include powder coat finish sealed with a clear coat to protect finish, attractively patterned table top has center opening to accommodate umbrellas, and nylon glides on all legs. Biscayne 5-Piece White Patio Dining Set with 48-inch Dining Table & Four Swivel Chairs with Cushions is rated 4.5 out of 5 by 2. Rated 4 out of 5 by Rp from Looks very nice and is comfortable. Packaging was outstanding.... Looks very nice and is comfortable. Packaging was outstanding. Assembly wasn’t bad, but remember to tighten factory inserted bolts when finishing assemblies for the swivel type chair or will find yourself leaning far back. Only concern is durability do to questionable welding.